Brachioradialis is a muscle in the forearm that flexes the forearm at the elbow. It also is capable of pronation and supination, for this reason it is vitally NB that aspiring drag flickers train this muscle. In this exercise the player will hold a dumbell over a bench with their palm facing upward first then they will do it with their palm facing downward. The athlete will lift the weight up only moving at the wrist joint. Sit on the floor with straight legs. 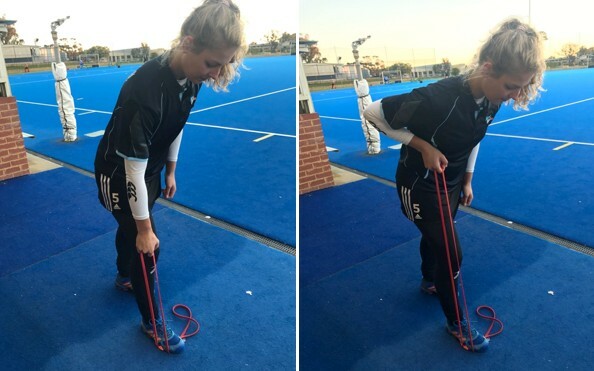 Attach the thera-band to your hockey stick and loop the thera-band over the balls of your feet. Keeping your back straight, pull the stick towards your chest and hold for 3 seconds. Stand on the band to get the amount of resistance that you want. Lean forward and bend your knees slightly. Keep your hands close to the side of your body. Pull the band up and hold this position for 2 seconds. Keep your back straight. Torso strength is VITALLY important in the art of dragflickling. You need to be able to twist your torso and having oblique strength is paramount in delivering power through the dragflick and overhead. Stand a few metres away from the wall with your shoulder facing towards the wall. Hold the ball and twist your torso powerfully in order to throw it against the wall. Catch it when it comes back and repeat. Start out by sitting at the end of a flat bench with a barbell resting on your shoulders. Grip the bar with your palms facing down and make sure that your hands are wider than shoulder width apart from each other. When ready move your waist from side to side whilst feeling your obliques contract. Only move slowly. Attach band to a bench/pole and stand one metre away from the band. To get more resistance stand further away. Keeping both legs straight. Loop the band over your ankle and pull the band across the standing leg. Holding this position for 2 seconds. See Images. Loop a band around your ankles. Take a lateral step and hold for 2 seconds before returning to starting position. Attach a band to a pole/bench and loop your foot into it. Stand that your back is facing the band. 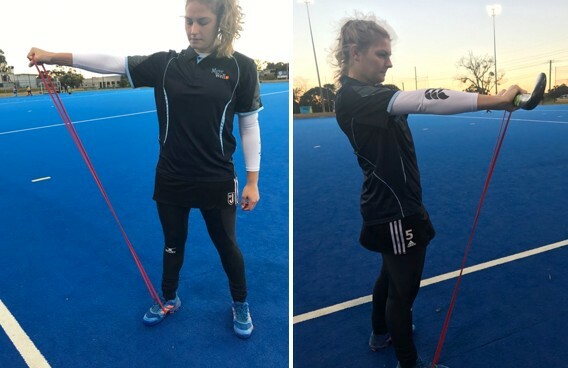 When ready pull your knee into your chest whilst activating your hip flexors. This movement is like a stationary High knees running drill. Hold onto your stick for balance. Attach a band to a bench.Loop the band around your ankle. Stand facing the bench. Keeping both legs straight, extend your working leg behind you, activating your hamstrings and glutes. Hold for 2 seconds and lower leg down. Place one foot into a TRX and while the other leg is slightly bent. Stand on your left leg and let your friend helping you stand on your left side (forestick hit in hockey) when balanced catch the medicine ball and rotate your torso to generate enough power to through it back to your friend. Repeat on your right leg. Attach the band to a bench. 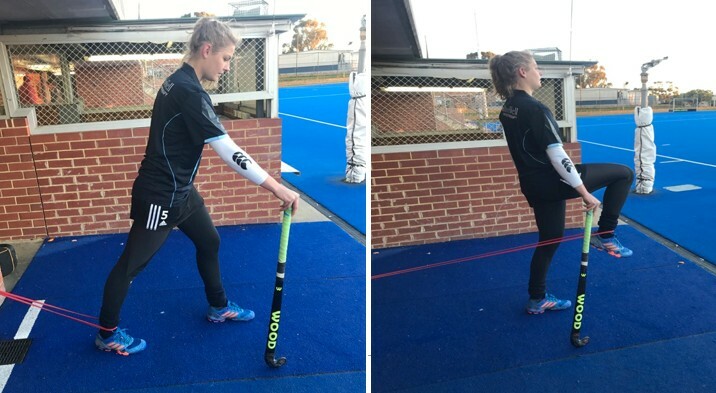 Loop the end of the band to your hockey stick and mimic the technique of a drag flick. Hold in the ‘ball release phase’ for 3 seconds and return to starting position. Only do this exercise if athlete is strong enough. Load the sled with desired weight. Take an athletic posture, leaning into the sled with your arms fully extended. Pushing the sled as fast as possible, focusing on extending your hips and knees to strengthen your posterior chain.